Recommendation: Highly Recommended to anyone interested in the Italian Air Force. While the title might be a bit of a mouthful, the rest of this book more than makes up for it. 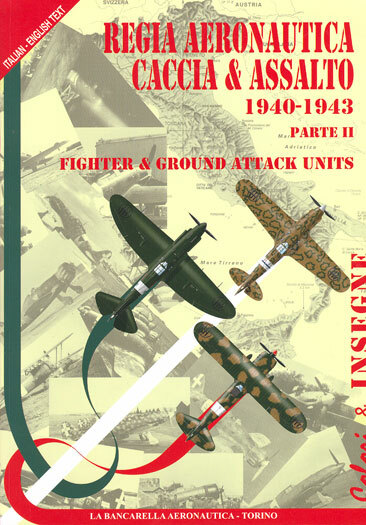 The artwork is amongst the best that I have seen, and it covers all the aircraft used by the Regia Aeronautica in the fighter and ground attack roles. Home grown, German and French types are all there. Part One of this series of books covered camouflage and markings up to 1940. This issue (Part Two) describes from 1940 until the armistice. The text explains colour changes and the reasons for various markings. In a separate chapter, all the colours are described and detail of their uses is provided. This book will be greatly appreciated by anyone interested in the Italian Air Force and by most of the rest of us as well! I can't recommend this book highly enough.